I really enjoyed both of the previous books in this series, and I was eager to find out what would happen next. This novel begins basically where the last one left off, with America being one of the final 4 girls in The Selection, and her and Maxon still deciding how their relationship is going to unfold. This novel contains more action and danger than the previous two, which pleases my adventure loving side immensely!!! Both the southern and northern rebels play a much bigger role, both as a threat, and as a physical presence. Without giving much away, we learn a great deal about both sets of rebels in this book, which answers a lot of the questions which were left unanswered from the previous two novels. I don't think this is too much of a spoiler but there is quite a lot of death in this novel, and some of my favourite characters didn't make it to the final page (sob). The fact that I actually felt something for all these characters is credit to Cass's excellent writing, all her minor characters were fleshed out, making it very easy to relate and feel vested in their progress and what happened to them. We also got to learn a bit more about America's family, I always struggle to remember who's who in her family, so this was handy for me to get to grips with them again! I still really love America's character a lot, although I am still frustrated by her indecision between whether she loved Maxon or not. She showed her bravery and her selflessness throughout this novel, and I still really love her narrative voice and her personality too.
. 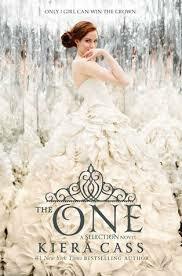 Surprisingly I actually disliked Maxon quite a lot in this novel, especially towards the end of this novel. Some of his decisions in this novel were so weird, he flipped in the way he treated America to such an extent that it started to really get on my nerves. Celeste however was the opposite. She was written to be the villain in the group of girls, she was the one who went around sabotaging the other girls and fighting America. However by the end of this book she became probably my favourite girl in the section other than America!! Overall I really enjoyed this book, it was a great third book in the series, and I'm really excited to see where the fourth book takes the series after the fantastic ending. hey I loved this book it was awesome. Me too!! I can't wait to get my hands on the next one!! Rachel has read 0 books toward her goal of 70 books. All the books I mention or review on this blog were purchased by me. I am not paid for my reviews on here. If I am given any books for review I will mention this in the review.